I really like his 3-D printed titanium part at about the 8 minute mark, and the chainsaw clutch at minute 10 is pretty neat too. 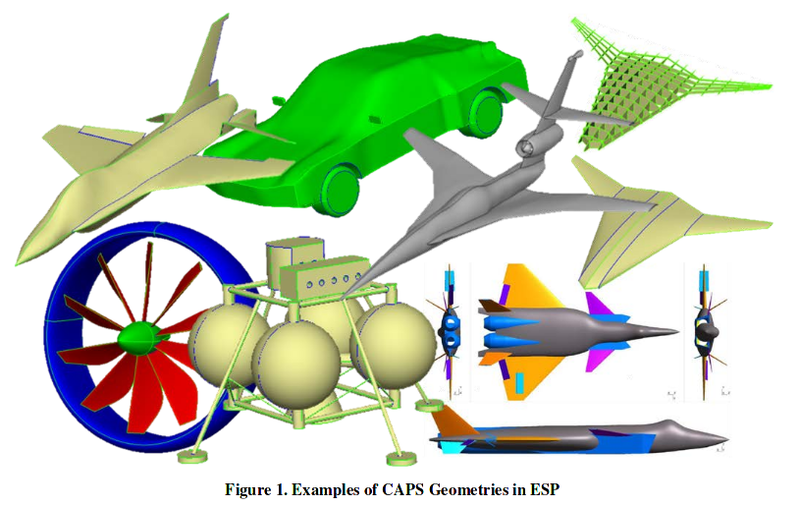 I haven't heard of Engineering Sketch Pad (source code as part of OpenMDAO, and here) before, but this is yet another NASA sponsored open source tool that could be useful to you for aircraft conceptual design. I read about it in a post on Another Fine Mesh about some interesting research the folks at Pointwise are doing. It reminds me of, but is different from, Open Vehicle Sketch Pad. It has some neat features that make it useful to support high-fidelity analysis. It creates watertight geometry, it can carry attributes with the geometry that could guide mesh resolution, it does "conservative" data transfer for discipline coupling (match a solver's numerical scheme), and most of its parts are differentiable which is useful for optimization. I added this to my list of Open Source Aeronautical Engineering Tools.